The importance of water tubes and water bags is they are essential in holding down the cover once it is secured with the cable and winch. These water tubes and bags are often seen spread out over the edges of swimming pool. These are extra protection to help ensure that swimming pool cover will not fall into the water. There are different sizes to choose from, there are single and double tubes as well sizes that range from 2 foot to 10 feet.We will showcase 5 different water tubes and bags. We will show you the 8 foot Water Bag 20 Gauge Non Rolling Double Chamber, 10 Foot Water Bag 20G Single Chamber, 10 Foot Double Water Tube Water Bag, Corner Water Tube 2 feet x 2 feet and the Step Water Tubes 4 Feet. We will show you why these water bags and tubes make a great addition to the closing of your swimming pool. Depending on the size of your swimming pool will determine how many of these bags you will need. Every swimming pool is different; consult your local representative at the swimming pool supply store to find out how many of these water tubes and bags you will need. 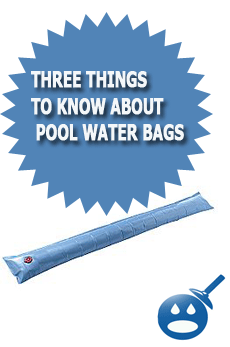 Let’s take a look and see which of these water bags and tubes will work best with your pool and cover. These water bags are durable water bags that are made with a strong 20 Gauge Vinyl. These water bags are made with high quality and high performance. They come equipped with no leak valves so they will last more than one closing season. These water bags are recommended to be filled about 1/2to 3/4 full. These bags will not freeze even in the cold winter months if you add some swimming pool antifreeze to the bag. Your cover will have extra weight when these bags are placed around the swimming pool. These bags are also non rolling bags no they won’t slide off onto the ground or onto the pool cover. The double chamber adds for extra weight and protection. They are safe and dependable and they make a great addition to the closing of your swimming pool. They are very affordable in price; you can find them in your local Kmart for $5.99. If you want to shop around you can find these bags at Wal-Mart or your local swimming pool supply store or home improvement stores. You won’t be disappointed when you add these water bags to your above ground swimming pool or in-ground swimming pool cover. If you are looking for something a bit bigger than the 8 Foot Water Bag there is the 10-foot. This 10 foot single chamber water bag is made to last. It is made with a strong and durable 20-gauge vinyl. These water bags are made with no leak valves so water won’t escape as the winter months go on. To use these water bags properly, you will want to fill them up about 3/4 of the way. Do not overfill. 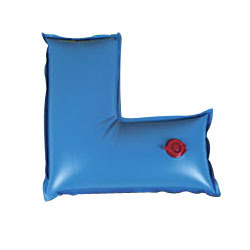 Place these water bags a few inches away from each other all around the swimming pool. If you are not sure how many you will need, speak to your local swimming pool professional. 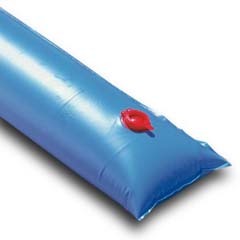 The 10 Foot Water Bags 20G Single Chamber are affordably priced around $ 5.99. You can find these water bags at your local Kmart, Wal-Mart and Sears Stores. They use simple water from the garden hose, nothing fancy. 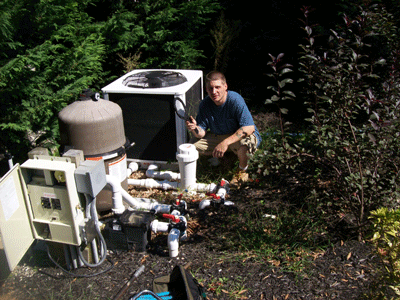 Fill and place, the water will not freeze over the winter if you add some pool anti freeze. When the springtime comes you will simply release the water from the bags and roll up until you need them again in the winter season. This style of water bag is made with up to 33% heavier material. These bags are made with 20 Gauge vinyl. These tubes should be placed about 4 to 6 inches apart around the swimming pool. It is recommended that you place these water bags near the swimming pool edges or more specifically at least 18 inches or so away from the inside of the swimming pool edge. It is also recommended that by placing some swimming pool antifreeze to the bags will prevent them from freezing up over the winter months. One of your biggest concerns may be a small animal like squirrels or birds that may poke these bags. Try to place some water or a feeder near the pool to keep these animals from trying to poke open the bags. Simply fill the bags with the garden hose and place along the swimming pool. Nothing could be easier for that added sense of protection. These bags costs about $5.99 and can be found in local swimming pool supply stores. 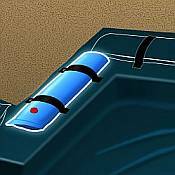 For those swimming pool owners who are familiar with trying to close the swimming pool with water tubes and bags know how frustrating it can be to lock down the corners of the cover. Now there are Corner Water Tubes, these are bags that are 2 ft x 2 ft and they fit perfectly on the corners of all kinds of swimming pools. These bags are made from a very heavy-duty vinyl that was designed to hold up to the harsh winter months. Simply add water from the hose and some anti freeze and you are ready to go. It is recommended that these bags are not filled more than 1/2 way in case you do not add anti freeze to the mix. The water in these bags will freeze and by filling up the bag all the way the bags will rip. These bags are about $3.99 and they can be found online or in your local retail store. To cover all of your bases, there are water tubes to help secure the cover around the swimming pool. These step water tubes are made 4 feet in length and they are able to cover and fill in all of the spaces you need to secure the cover around the steps. The steps are where the cover may be a bit vulnerable so every extra protection is needed. These bags are made with a heavy-duty gauge vinyl that is built to last for many pool seasons. The valves are high quality no leak valves that is able to fit a garden hose inside without a lot of spillage. Like the other water tubes, do not fill up all the way in case of freezing. Add some swimming pool antifreeze to the bags and they will not freeze. These bags are an important part of the closing and securing of the swimming pool. The bags are $5.99 and can be found online or in local stores that carry swimming pool supplies. Keeping the swimming pool cover secure is very important. By holding down the cover offers a better chance that your swimming pool will open without having to spend too much time cleaning it. You can avoid many problems such as buying a new cover or possibly fixing the liner when the liner is exposed to the elements of the weather. 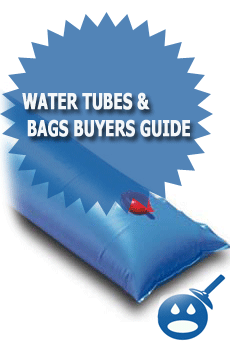 There are many different styles and types of water tubes and bags. But it is recommended that you use a heavy-duty gauge, the better the quality the better the performance you will get. You can find these water tubes and bags at your local swimming pool store or you can try your local Home Depot, Lowe’s, Kmart, Wal-Mart or Sears. There are so many places to get these bags from. If you are in need of bags, try to find them on your own before you call your local pool company, they will increase the price that you would be paying in the stores. If you are trying to save more money this year, try picking these bags up on your time. You will definitely save some money. Thanks for the information. Do I need to put anti-freeze in tubes or only water? Hi there i am looking for bags that can hold down my tents it must be 1000 mm x 200mm diameter water filled.